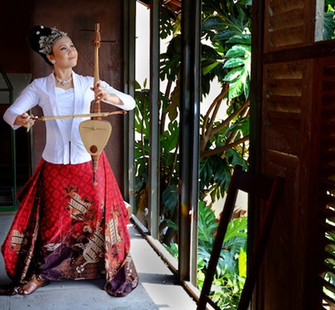 Peni Candra Rini is an accomplished composer, educator and one of few female contemporary vocalists performing sindhen, a female soloist style of singing. Strongly committed to preserving and sharing the musical traditions of her country, Peni has collaborated with acclaimed artists from within and outside Indonesia, including Robert Wilson (USA), Albert Chimedza and Mbira Centre (Zimbabwe), Geisser Mazzola Duo (Switzerland), Kamal Musallam (Dubai) and Gilles Saissi (France). She has performed at major festivals including Harare International Festival of the Arts (2008, 2011, 2012), APPEX Bali (2010), Lincoln Center White Light Festival (2011), Jeonju International Sori Festival, Korea (2012), ASEAN Enchanting Puppets Festival Chiang Mai, Thailand (2013), APAM 2014 (Australian Performing Art Market) and WOMADELAIDE Festival 2014. In 2012, she completed an artist residency at the California Institute of the Arts with a grant from the Asian Cultural Council. In addition to her extensive work as a performer, Peni is also a lecturer at the Indonesian Arts Institute in Surakarta, Central Java.